Carries out schedule servicing to mobile equipment in a safe manner and in accordance with the service sheet. Utilise skill and experience to create minimum downtime on machinery. Ensure correct recording of maintenance is achieved. Maintain a high level of housekeeping in workshop and working areas at all times, ensure all parts are kept at minimum stock levels. Read and interpret Service and Spare parts manuals. Report all equipment faults to the Maintenance Supervisor / Foreman for scheduling into the workshop. Ensure site and maintenance procedures are maintained. Assists with training of other trades people to support a constructive team environment. A demonstrated passion for safety and a proactive attitude toward ensuring that safety is front of mind for all employees at all times. Strong background working with underground mobile mining equipment, including, CAT, Sandvik, Atlas and Copco. At least 2 years post apprenticeship experience. High degree of skill in troubleshooting problems on electric hydraulic drilling equipment. Good knowledge of loader and truck maintenance. Competent on Auto Electrics, Hydraulic Circuits and Diesel engine maintenance. Self-starter who will work with minimal supervision. Excellent service and maintenance approach to the job. Willingness to learn to improve skills and gain further experience on mobile equipment. Extend ventilation services to areas where needed, underground infrastructure works, which includes hanging ventilation bag and moving / installing secondary fans. Extend water and air services to areas where needed. Erection of vent walls and brattices. Manual installation of cable bolts and grouting to site spectifications. Move and install pumps to areas where needed and pumpline and leaky feeder, firing lines. Repair services and equipment within capabilities, such as vent bag, poly pipe and valves. Access face and back conditions at the start of the job and scale from height according to site requirements. Assist with operations including off-siding operators as required. Mine logistics – supply of consumables. Carries out schedule electrical servicing of light vehicles and mobile machinery in a safe manner and in accordance with the service sheet. Carries out all repairs in accordance with Barminco procedures. Completes all service sheets and document additional repairs completed during servicing. Maintains a high level of housekeeping in the workshop and working areas at all times. Advise the workshop supervisors of parts used and any additional part requirements. Strong background working with underground mining equipment. Able to operate all types of hand tools. Previous experience in Vehicle Air Conditioning systems. Ability to analyse equipment failure and use equipment diagnostics tools. Auto electrical experience on 4WD vehicles. Willingness to learn and gain further experience on mobile equipment. o Bog out and clean faces ensuring it is left acceptable for next cycle. This may also include inspecting for mis-fires including notification to Shift Supervisor, hosing down and scaling. o Keeps all roads in working area tidy and free from pooling water and other potential hazards. o Manual and tele-remote bogging of production stopes to stockpiles. o A demonstrated passion for safety and a proactive attitude toward ensuring that safety is front of mind for all employees at all times. o Significant experience in the Underground Mining Industry (for example a minimum of 10 years). o Knowledge of Underground Mining Practices. o Trained and competent in the operations of an Underground Loader. Trained and competent in the operations of Underground Tele-Remote Loader. Trained and competent in the operations of Underground Development Jumbo and / or Underground Production Drill. install cables in areas where required. To ensure cables are fully encapsulated with the proper mix of grout. Keep all equipment clean and in a serviceable condition. Two years underground mining experience. Good knowledge of ground support. Handles and transports explosive material in a safe manner according to procedures. Charge up holes, down-holes and drives using blow-loaded ANFO and low impact explosives or emulsion. Charge up and fire stope blasts according to blast plan. Ensure working area is safe for personnel and equipment to perform duties. This includes but is not limited to, check scaling or rehabilitation, ensuring lanyards are in good order and used when required. Liaises with Geologists, Engineers and Shift Supervisors to optimise blast designs. Minimum of 5 years exposure to the Underground Mining Industry. Knowledge of Underground Mining Practices and the efficient operation of an Underground Charge Up Machine. Accurately drill a number of drive drill patterns using a mechanised electric/Hydraulic Jumbo drill suitable to ground conditions and in compliance with site specific drill patterns and survey instruction. Assess ground conditions at the face and implement ground control according to site requirements. Read and accurately follow mining instruction plan with skill and precision ensuring holes are drilled to design line, gradient and profile. Communicate with surveyors, geologists and engineers as required. Optimise drill patterns to ensure maximum advance per round is achieved whilst maintaining strict adherence to design specifications. Ensure work area is safe for personnel and equipment to perform working duties including ensuring electrical installations and services are clear of the drilling area. Knowledge of Underground Mining Practices and the efficient operations of an Underground Jumbo. Undertakes preventative, scheduled servicing and maintenance to light vehicles and mobile machinery in a safe manner and in accordance with the service sheet. Diagnose faults and recommends repairs and / or improvements. Is proactive in all preventative maintenance procedures and carries out all repairs in accordance with Barminco workshop procedures, standards and work instructions. Completes all service sheets and documents additional repairs completed during servicing. Reads and interpret Service and Spare parts manuals. Extensive experience working on mine site light vehicles. Be able to operate all types of hand tools. Some welding (Oxy Acetylene) experience. Ability to analyse equipment failure and to use equipment diagnostics tools. Brake system and basic hydraulic knowledge. Ability and willingness to train co-workers when required. Accurately drills a series of Longholes to a design pattern using a mechanised drill. Reads and accurately follows mine instruction plans with skill and precision ensuring holes are drilled to design line, gradient and profile. Communicate with surveyors, geologists and engineers to optimise drill patterns and metres. Set up and troubleshoot on Longhole Drill rigs, specifically on the Tamrock 1520 and 720. A minimum of five year’s experience in the Underground Mining Industry. A minimum of 12 months experience solely as an Underground Longhole Driller. Knowledge of Underground Mining Practices and the efficient operation of an Underground Longhole Machine. Highly organised and able to work efficiently with limited supervision. Delivery and pick up of equipment such as tools, explosives, piping, services and anything else that is needed for the smooth operation of the Underground Mine. Delivery and pick up of Underground workers. Removal of waste items from Underground workings to waste dumps. Assisting Jumbo Operators with bolting and meshing as required. Set up headings with bolt and mesh and assist service crew when possible. Ensures mining operations are conducted in a safe manner and any safety issues are promptly reported to the Underground Foreman and Site Project Manager. Ensures ore is mined efficiently to the satisfaction of geology personnel and ensuring targets are met. Performs the daily supervision of the working areas of the mine in accordance with all relevant Acts and Regulations. Looks after the Principals interest with regard to duty of care to all employees, sub-contractors and visitors whilst also ensuring that each employee understands and accepts responsibility for his or her own safety and health and that of their fellow employees. Conducts daily work planning meetings / toolbox meetings. Completes paperwork required by the Site Administrator with respect to shift workers’ pays. Assist Mine Foreman complete and submit any Workers Compensation, quality, etc… paperwork. Submits incident reports in writing to the Mine Foreman/Site Project Manager for incidents that occur on shift as soon as possible but no later than 24 hours after the incident. Make sure all tasks given are conducted in a safe manner. Liaises with any Contractors on site, ensuring their work is coordinated with the other mining activities. Upholds Company policy on discipline and counsel personnel accordingly. (In conjunction with the Mine Foreman/Site Project Manager). Assists performance appraisals on site personnel in conjunction with Mine Foreman. Ensure all operators have completed a SWIC. Ensure visual leadership interactions are undertaken. Ensure all mine instructions are followed. Maintain senior first aid certification. Summarising production details on daily sheets. Must be deemed medically fit for the role as determined by medical examinations and functional assessments. Must have at least 5 years underground mining operations experience or 2 years if a qualified mining engineer. Ability to set and maintain high standards of housekeeping. Understanding drilling and blasting techniques. Understanding both equipment and human resource capability and productivities. Understanding mining techniques and ability to optimise mine production. Ability to communicate and liaise with both employees & site manager. Ability to identify potential hazards and minimise risks. Understanding appropriate statutory and mining regulations. Must have at least 5 years underground mining operations experience or 2 years if a mining engineer. Plans and coordinates activities of personnel engaged in underground mining activities. Reviews data, such as maps, survey reports, and geological records, and consults with engineering, maintenance, and supervisory personnel to plan and direct mine development. Reads mining laws and safety regulations, and issues directives to workers to ensure adherence to applicable rules and regulations. Reviews and consolidates records, such as, safety reports, and production records. Supervision of Underground Shift Supervisors and provide direction and assistance with planning of mining activities in accordance with the Mines Act & relevant Safety and Environmental regulations. Liaise with appropriate client contact ensuring expectations are realistic and projected targets are achieved safely and to specifications. Act as Relief /Alternate Site Manager during their absence, adhering to agreed schedules, programs and targets. Coordinates manpower, roster preparation, annual leave scheduling and assist with employment / deployment of workforce. Promptly act on any safety issues that arise, ensuring accident / incident reporting is carried out and followed up. CarryoutregularinspectionsofplantandequipmentandcommunicatewiththeMaintenance Department regularly on equipment scheduling. Maintain accurate records relevant to the role in accordance with the Mines Act. Ensure inventory is correctly accounted for on a shift-by-shift basis. A minimum of 5 years exposure to the Underground Mining Industry is required for this position. Ability to coordinate activities and schedule labour. Ability to assess mining working conditions and environment. Ability to recognise potential mining hazards and risks. Ability to listen and take instructions and work in a team. Ability to attend to housekeeping. Ability to optimise mine production. Ability to implement and maintain mining training programs. Ability to handle conflict and disputes. Because of SGS Human Resources Corporation, my dream of working in Australia is now a reality. This is a 100% legit POEA-accredited recruitment agency. 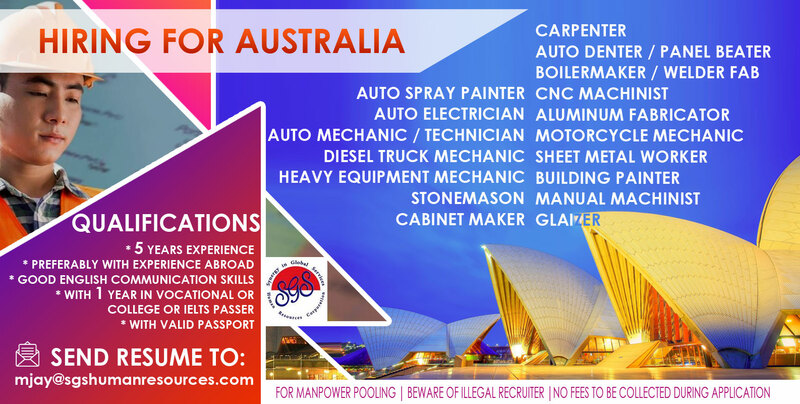 Secure your future, apply at SGS and have a job in the land down under. For me, SGS Human Resources Corp. is the best agency I have ever been to. From the time that I applied until I was deployed for Australia, I did not feel any neglect. All of their employees cares for you very well. They have helped me achieve my dream of working here in Australia. SGS is the reason why I am earning a lot of money now so I can save and buy my dream house for my family.